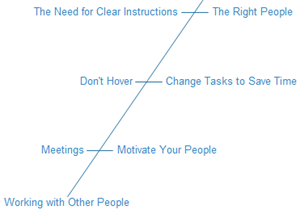 Bear some skills in mind so that your cause and effect diagram can be laid out better. Use a ready-made template so that you can skip this hassle. 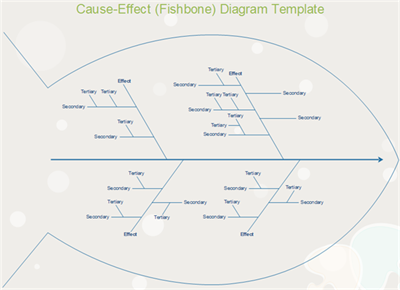 The main frame of a cause and effect diagram resembles the fishbone, so it is also called fishbone diagram. In real application, the layout styles can be more flexible. Here are a few options for your reference. Choose the best style according to your contents. A typical cause and effect diagram is made up of fish mouth, backbone and smaller bones. The effect or goal is embedded in fish mouth, and causes or factors are located in the text boxes on the fish bones. These factors can be divided into primary causes and secondary causes and more. 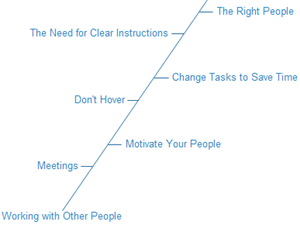 If the causes or related factors are small in quantity, you can consider laying out all factors in the same side. In this way, the diagram looks neat and organized with all branches parallel. Note: when you are dragging out shapes to represent causes, remember to use the same one so that all lines are in the same size. Use grid lines and dynamic grids to evenly distributed bones. Release the mouse when the connection points turn red. Make sure that all branch lines are connected with the backbone so that the diagram can become a whole. View an example below. You can download it to ease your process. 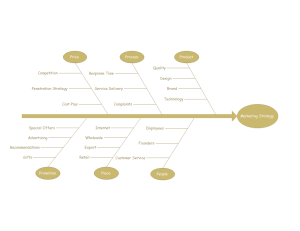 This fishbone example is provided to facilitate our users in fishbone diagram designs. You will find it amazingly convenient to have this editable template. Click the picture to view full size and download it. Both PDF and editable formats are available. In the case when there are many secondary causes, you had better locate them on both sides of the branch. In this way, the text won't look too cramped. The technique to do this well: don't put two sub branches on the same level otherwise they will look like a single cause. Locating causes in different levels is more aesthetically beautiful. Compare these two ways. Sometimes, tertiary causes or more may occur if an issue is complicated. Under such circumstance, note that bones for different level of causes should be at different length, with higher level causes represented by longer lines. Sub branches can be located on one side or on both sides according to actual need. Edraw offers an easy way to create cause and effect diagrams to systematically review factors that affect or contribute to a given situation. Simply open a template and add shapes from the library. You can use a nice looking pre-defined theme with only one click, or customize through line, color and size settings. The software is also designed with a group of editing tools for resizing, rotating, grouping, order, align and distribute, which greatly simplify the drawing process. 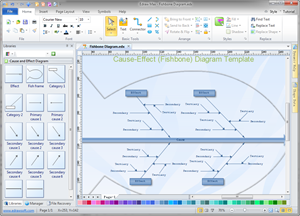 Discover the magic of Edraw as a cause and effect diagramming software: Try it FREE.